Working for event management company MEDIAmaker, XL Events recently supplied multi-screen projection, mapping, live interactive elements, camera system and audio systems for a corporate conference and awards ceremony serving 1200 delegates and guests. The event, held at Telford International Centre, was spread across a total of six rooms, as well as being webcast live to an invitation-only microsite which allowed attendees in remote locations to login and view the awards in the evening. 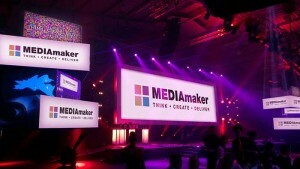 In the primary room the main focus was a twin projector blend using two of XL’s Barco FLM HD20s on to a 13m x 4m screen. The blend was controlled by an Encore unit, also from XL Events, which was programmed and controlled by Charlie Archer. This screen displayed keynote presentations, awards films and other graphical elements. Either side of the main screen two stacks of flown boxes were mapped with a range of content displayed including IMAG footage from the cameras, a live Twitter feed, the event’s Instagram feed and other special effects and logos. XL Events mapped and controlled the content on to each box using three Pandora’s Box HD media servers, managed by Dan Mulcahy, and the projections were thrown across the room from four of XL’s Barco HDF-W26 high brightness projectors. The camera system consisted of four HD camera channels into one of XL’s HD PPUs. These supplied not only the live footage for the boxes, but also the images for the live webcast. XL Events used six Grass Valley Turbo units to capture an HD ISO and TX records of the event. The projection and video systems were managed and controlled by Nigel Griffiths and Justin Beardsall. Audio in the main room was delivered by a full L’Acoustics Line Array – DV-dosc with Vi4 digital mixing and Adamson on-stage monitoring, also from XL. An additional plenary room was equipped with a Barco FLM HD20 projector and screen for the presentations, coupled with an L’Acoustics Kiva/Kilo Line Array to deliver the audio. XL Events’ audio set up for all of the rooms was designed by Alex Mulrenan and engineered by Christian Lewis. Finally four breakout rooms for the divisional meeting sessions were equipped with Panasonic 12, 10 or 6K projectors and LS9/Q7 audio setups. XL Events project manager, Andy Mayneord, commented: "It was great working for Paul Kennie and the MEDIAmaker team on this event. Whilst there was quite a time challenge to bring everything together – only one month from inception to show day – the event planning from Paul and his team made sure everything went smoothly. With so many live elements of the show, including presentations, webcasting and Twitter feed, it’s essential to get everything right first time, and I’d like to thank our crew for pulling together to ensure a first class result!"